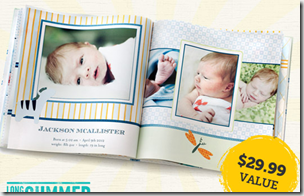 Shutterfly offers one 8×8 hardcover photo book when you enter promo code SUMMERBOOK for Free. Alternatively if you are a new customer you can grab the same offer from Babycenter here. Offer expires September 12, 2012 (11:59 P.M. PST). Offer is good for $29.99 off one (1) photo book with hard cover at Shutterfly.com. Photo book must total $29.99 or more excluding additional pages, taxes and other charges in order for discount to apply. Offer valid for one-time redemption per billing address. Offer not valid on 7×9, 5×7 and soft cover photo books. Taxes, shipping and handling will apply. This offer is not redeemable for cash and cannot be sold, transferred or combined with other offers, discounts, promotions or credits.